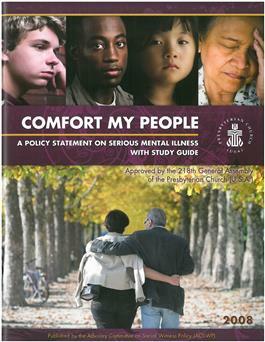 This policy approved by the 218th General Assembly (2008) is the first major serious mental illness statement approved by the Presbyterian Church (U.S.A.). This report uses the biblical theme of exile to describe the challenges experienced by persons living with a serious mental illness. The first theme, ""The Land of Exile,"" describes the difficult challenges people living with a serious mental illness face far too often, such as a feeling that they do not belong or are not welcomed in the church. The second theme , ""God's Call to Comfort,"" describes appropriate ways congregations can minister to and with people living with a serious mental illness and their loved ones, and/or other primary caregivers, such as providing a space for a support group for this people of God. This report affirms that, although we, the members of the Body of Christ, cannot discern why there is suffering in God's good and lovely creation, the church can proclaim that no aspect of serious mental illness can separate us from the love of God in Christ Jesus our Lord.